Heater bands are metal filaments encased in a protective covering that converts electricity into heat. This useful heat energy is then transferred in a controlled method to another object through convection or conduction. Convection is when a heating element does not have to be in contact with the object it is heating. 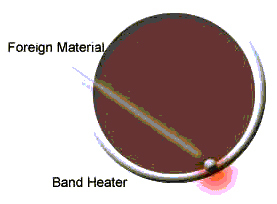 Conduction is where the heater band directly contacts the object it is heating. In the plastics industry, the mica band heater provides a means of applying heat to any cylindrical machine part, mostly the barrel, end cap, or nozzle of plastic molding equipment. They are conductive heaters providing thermal conductivity to the outside steel surface. The heat transfer from the mica band to the barrel plays a major role in determining the heater life as well as the efficiency of converting electrical energy into heat for the barrel. The mica heater band is designed and constructed for long, efficient service. The construction design and materials used in mica band heaters have demonstrated achievement of the necessary long service life for high productivity of plastic molding and extruding machines. PS&E mica-type band heaters have several advantages over other types of band heaters. What makes them the most used heater in the plastics industry is the combination of reasonable high-watt density capabilities, reasonably high temperature capabilities (900° F), their efficiency, lifetime expectancy and low cost. Important parameters to consider when specifying band heaters are: maximum operating or sheath temperature, AC voltage required, and watts. Electrical power is measured in watts. Maximum operating temperature is the maximum temperature that the sheath covering the heater may reach. The maximum sheath temperature does not represent the maximum temperature that a heated substance may reach. AC voltage required represents the minimum AC Voltage required to operate the heater. Watts represents the maximum wattage available from the heater. Important dimensions to consider for band heaters are the inside diameter of the band, the width of the band and the thickness of the band. The heater inside diameter should be the same size as the outside diameter of the heater cylinder to be heated. Mica band heaters are manufactured by enclosing a precision wound nickel-chromium resistance ribbon inside a specially treated steel sheath. Mica is used to insulate the resistance ribbon from shorting out against the outer steel sheath. Mica band heaters are designed with nickel-chrome resistance wire precisely wound around a mica sheet, which is then placed between two additional corrosive resistant outer mica steel sheets. Mica is used because it provides good thermal conductivity and dielectric strength. It can withstand voltage spikes, resist moisture, and is flexible enough to conform to the curvatures of plastic molding machine barrels. Since mica is also a heat insulator, only top grade mica, which is inorganic, has high temperature stability, and is “paper thin” is used. This “paper thin” characteristic enables a quick transfer of heat through the mica to the outside steel sheath, thus transferring the heat away from the red hot internal resistance ribbon winding. The four basic parts or components of a heater are the resistance element, the insulation, the sheath and the termination. The resistance element is the “heart” of an electric heater. The resistance element is usually in the form of a small diameter, metal alloy wire or flat, thin ribbon. When a heater is connected to an electric power supply (Voltage) or electricity flows through the resistance wire. The wire resists the flow of electric current through it, and this converts electrical energy into heat energy, causing the resistance element to get very hot. That is how heat is generated in an electric heater. Watt density is a measure of the rate of heat being transferred through the surface of the heater. That is, if you were to draw a 1”x 1” square on the surface of the heater, how much heat would pass through that 1 square inch area. This is call watt density and it is measured as watts per square inch. Other things being equal, the higher the watt density, the higher the temperature inside the heater. As the temperature inside the heater increases, the materials inside the heater are operating closer to their breaking point resulting in shorter heater life. Generally, for satisfactory life in a mica band heater, the watt density should be less than 50 watts per square inch for heater diameters less than 3 inches, less that 40 watts per square inch for band heaters with diameters between 3 and 6 inches and less than 35 watts per square inch for mica bands with diameters between 6 and 10 inches. The mica band heaters inside diameter should be equal to the outside diameter of the plastic machine’s barrel. The diameter must be exact since a difference would be compounded by a factor of pi (3.1415926) on the circumference of the band. This would mean that a 1/4” (0.250”) error on the diameter results in a shortage or overage of approximately 3/4” (0.785”) on the circumference. In those rare cases when the barrel diameter cannot be measured with accuracy, it is advisable to specify an adjustable heater band with the approximate range. When all else fails, it is better to estimate heater diameter slightly smaller as opposed to too large. This would ensure adequate tightening of the heater, provided the difference is no greater than 1/4” on the diameter dimension. If a heater with too large a diameter is used, the ends will come together and prevent the heater from being drawn to the cylinder. However, the exact dimension is necessary for optimum heater performance. A rough spot or foreign material on the barrel can greatly reduce the life of your band heater. A small particle can leave an air gap on either side of itself which can cause a “hot spot.” Air will not conduct the heat away from your heater as fast as the metal of the barrel. This results in a spot on the heater where the temperature will be significantly hotter than the rest of the heater. The two-piece mica band heater is used on larger barrel sizes, or where band heaters cannot be slipped over the end of the barrel without meeting obstructions. Each half of the two-piece heater is rated at ½ total voltage and ½ the total wattage for connecting in series with a jumper wire. For example, a two-piece heater can be rated for 240 volts each half. In this case, the heaters are wired in series for 480 volts or put in parallel for 240 volts. Two-piece heaters are also available with many other voltage ratings, such as 120, 60, etc. Mica bands can be made in three or more sections when barrel diameters are larger than 20”. Such applications would include blown film extrusion dies. Most mica band heaters do not actually “burn out”. Instead, it is often environmental factors that create a short, cause hot spots to develop, or simply push the heater beyond its normal operating temperature. All of these factors cause a heater to fail prematurely and require replacement. Obviously, minimizing these environmental factors can reduce the frequency of replacing band heaters in your operation. The most frequent culprit of band heater failure is contamination. Liquid plastic, hydraulic oil and moisture (often from high ambient humidity) are three main causes of premature failure from contamination. Obviously, keeping the heaters free of contaminants will reduce the failure and replacement rates. Most heaters fail from the severe lead wire damage caused by contamination not from contaminants finding their way inside the band. The second most common cause of premature failure is poor contact between the machine barrel and heater band. 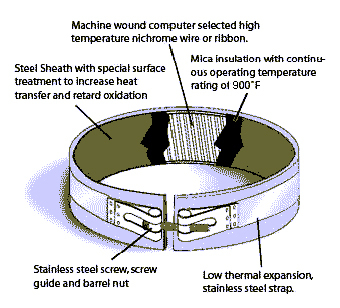 Without a tight fit, localized hot spots can be maximized on the band and cause the nickel-chrome resistance wire to fail. Often, failing to understand a heater’s internal design leads to heater losses. For instance, stretching a one-piece mica band over a barrel during installation can damage the internal mica, resulting in a short circuit. Some manufactures will offer installation techniques inappropriate for a specific heater types and these will cause problems. So, in cases where one heater design will not work, for example, if a band cannot be installed over the end of a machine barrel without stretching the heater, use a heater that is better suited to application such as a two piece mica or a one piece expandable band. A two piece design minimizes the chance that air gaps will develop. Another simple handling tip is to use two wrenches to install the wiring onto the band’s post terminations. This practice can eliminate failures because the wrench on the post’s lower nut acts as a strain relief. If this procedure is not followed, the post’s internal connection to the nickel-chrome resistance wire can be damaged and become a weak link within the heater. Before installation, clean and smooth the machine barrel surface, removing any plastic residue. After proper actions are taken to assure there is no power going to the heater and that the heater will not cycle on, follow a strict installation and tightening procedure. To install, tighten the heater snugly to the barrel using a clamping bolt torque of 10 ft/lb. Next, apply power to the heaters and allow them to reach halfway to set point. Once at this temperature, cut the power and retighten the bands at 10ft/lb torque. Make a habit of checking the tightness of the band heater periodically and you will be surprised at how you can increase the life of your band heaters.